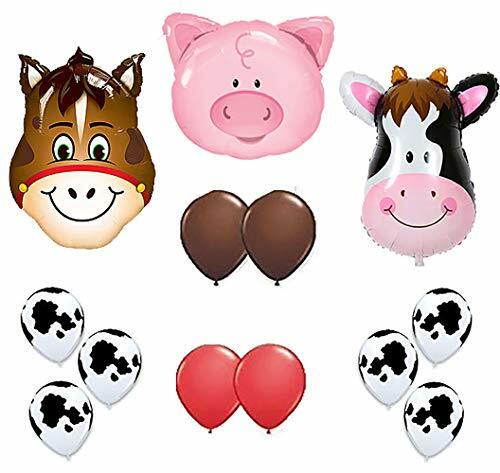 Farm Animal Balloons 36" Cow Donkey And Pig With 12" Helium Quality Latex Balloons Red Brown And Cow Print Balloons- Total Of 39 Count. 36" Cow, Pig And Donkey Shape Mylar Balloon- 1 Count From Each. x12 Red balloons x12 Brown Balloons x12 Cow Print Balloons- Total 36. Add A Flavor To Any Special Farm Barn Animal Birthday & Party Decoration. Coordinate With Other Party Supplies And Decorations From "My Party Balloons". If you have any questions about this product by Mother&Fabulous, contact us by completing and submitting the form below. If you are looking for a specif part number, please include it with your message.